Content and community on the X-axis. 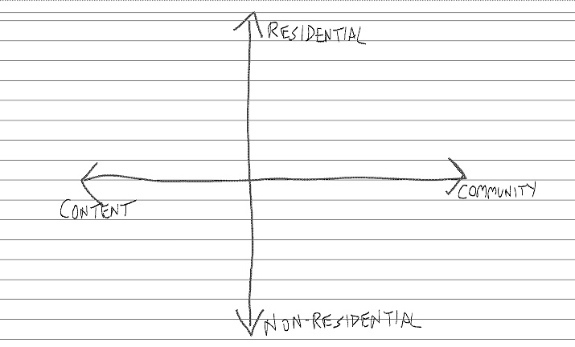 Residential to non-residential on the Y-axis. I think I’d want to add more axes too – certification, cost – but golly, I make lousy diagrams. As a result, we are overlooking a lot of other things that college provides at the other end of that X-axis: the “community” element that connects us to other learners, like-minded individuals, scholars, experts, colleagues, team members, recommendation-letter-writers and so on. And by extension, we largely ignore how technology could affect that. But I think there’s plenty of opportunity – for startups and for institutions – to use technology to enhance the community side of the equation too. Online community is, of course, part of the impetus of the first connectivist MOOCs. It’s what drives DS106. Offline, it’s what makes the network of a Harvard MBA so powerful too, I should add. And it’s one of the things that makes Fidelis such an interesting startup.